The Talla Linns is the name of a waterfall at the top of Loch Talla. Linn is Gaelic and Old Scots for waterfall. The Talla Linns are a series of waterfalls on the Talla Water, at the head of the Talla glen. At the time of the Covenanters there was no reservoir there, and it was a very remote spot. The site was used for a number of conventicles. 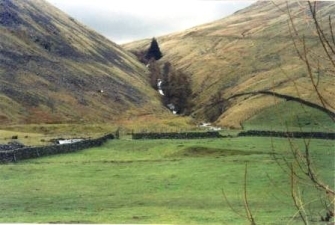 John Graham of Claverhouse, who was Sheriff of Dumfriesshire, had expanded his activities eastwards and was determined to stamp out the conventicles that were taking place at Talla Linns. Claverhouse, writing to the Duke of Queensberry, relates the circumstances of missing the society convention of June 1682 at Talla despite having a dragoon billeted at the Bield in Tweedsmuir. He mentions that there were six or seven score Whigs and how a few days later, he heard from the minister (Rev. Francis Scott) that they did not prejudice in his house, further than meat and drink. The date of June 1682 for the Society Convention is confirmed by Michael Shields in his Faithful, Contending, Displayed. The United Societies' third convention took place here on 15 June 1682 - this was when Claverhouse was nearly captured as mentioned above. The Great Conventicle was four months later on 11 October 1682. The Great Conventicle lasted three days and was well attended - It would be said later that upwards of 5,000 men, women and bairns were at Talla Linns that day. Many residents of Tweedsmuir, approximately 100, that included wives, servants and children, were cited by the minister, Francis Scott, on 1 January 1683 for being at Talla Linns - whether this was in connection with the Great Conventicle or other conventicles is not clear. The list prepared by Rev Francis Scott was titled "The names of disorderly persons within the parish of the new church of Tweedmoor, befor the Laird of Meldrum came into the samine for tryal of the rebells thair in armes att Talla Linne."